The Tree of Life represents the interconnection of all living things. For the Celts, reverence for Trees lies at the heart of Celtic spirituality and the Ancients envisioned the entire cosmos in the form of a tree whose roots grow deep in the ground, branches reaching high into the heavens. The Elemental Tree links and connects the earth below, and the heaven above, with the ancient four elements of life - earth, water, fire and air, four directions and seasons that circle around the strong pillar axis of the World Tree. The triskele spiral An Thríbhís Mhòr at her center, is a profound spiritual symbol for the Celts. The triple form spins at the heart of Celtic culture, patterning their mythology, religion and art - representing birth, death and rebirth, and the three realms of sea, land and sky. 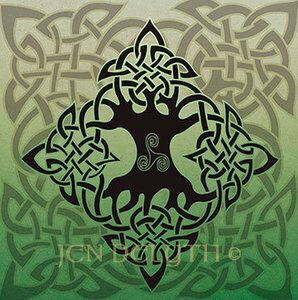 Traditional Celtic dances weave intricate patterns of circles, spirals, squares in arrangements of threes and fours - a dynamic expression of the eternal knot - the Elemental Tree of Life.